Deposit $800 to book with remaining balance due 1 month before workshop. Deposit $800 to book, with remaining balance due 1 month before workshop. I am occasionally available for "one on one" private workshop/tours in between my small group workshop/tours. The availability of private workshop/tours come up randomly so please inquire by email if you desire a personalized tour. Rates are $600 a day, plus fuel. "I’ve had the opportunity to join Mark on both a group (Patagonia) and private (Southwest) workshop. If your goal is to stretch beyond your comfort zone, to see (and photograph) locations that are a bit out of the ordinary or if you just want to become a better photographer – I can’t recommend Mark any higher! His passion and dedication to his “job” has no limit – and makes the entire experience thoroughly enjoyable. Mark has the ability to provide whatever level of assistance you need – without being overbearing or condescending. A truly great time which has me looking at the calendar to book another adventure!" "I have had the benefit of working with Mark in both (1) online post processing classes, and (2) photo tours in the field. With regard to Mark’s post-processing classes, he does an excellent job of explaining his overall approach to correcting and enhancing images and following that up with a detailed, repeatable process for making the most of a given image. Mark explains image correction and enhancement in a way that is easy to understand. Aside from that, the breadth and depth of this knowledge is impressive. He understands techniques that, when applied, make an image truly stand out from others. Finally, his print production expertise speaks for itself. Simply put, his prints stand out from those that I have seen in galleries around the U.S., including Las Vegas and New York. In the field, Mark’s passion makes his photo tours a once in a lifetime experience! Mark is passionate, focused but very personable.. He does not hesitate to chase down weather systems, check tide tables, moon phases, and every other bit of information to maximize the opportunity to come away with great images. First and foremost – Mark concerns himself with making sure his students understand the process – in terms of approach, composition, etc. He teaches on the fly and gives you as much information as you can handle. It is an awesome experience, to say the least – and well worth it for anyone who truly wants to improve." "The private workshop I attended with you was the best workshop I've ever been on, and I have been on many workshops with ALL the top name photographers. You are an incredibly talented nature photographer who is fully committed to serving your client both in the field & with outstanding post processing tutoring. My goals were to bring my capture & post processing skills to the next level & have a lot of fun along the way. You fulfilled those goals beyond my wildest expectations! I cannot thank you enough for the best week I've ever had doing & learning landscape photography. You are free to post my testimonial." "I had a awesome time spending 5 days with Mark in his backyard of Oregon and Washington. He knows all the locations and passionately helped me get all the shots I wanted. He's also a Photoshop guru and EXCELLENT teacher! I have a reasonable understanding of Photoshop and Camera Raw but Mark brought my knowledge to a whole new level. Thanks Mark!" If you have ever wondered what it’s like to go on one of Marks workshops… let me tell you, it is a fantastic adventure, and one you will never forget!!! If you have already experienced it, then you know what I’m talking about. Mark is a master at studying the weather to get the best possible locations, for amazing skies. He wants to insure that his clients will have the greatest chance for an Epic image, as well as an incredible experience!! There are not many people who have the enormous amount of knowledge about Photography that he does!! Not only is he knowledgeable, but he is a great teacher as well. He makes every effort to make sure you understand what he is trying to teach you! He has a huge amount of patience, and will answer any questions you might have. Trust me, I had plenty. My hope in taking his workshop was, to continue to work on my compositional skills, plus a few other things I wanted to learn. He taught me how to go about getting the best possible composition I could. He is relentless in searching out every angle and foreground, and taught me how to do the same. He takes his time, and explains why he does it the way he does. All you have to do is look at his images, and know his methods work. The post processing part of the workshop was fantastic. He goes through things step by step, working on one of your images. He will also record the session, which I was grateful for. On only a few hours of sleep, it’s a wonder I was retaining much of anything… lol His skills are just simply astonishing! I cannot say enough good things about Mark.. He’s not only a fantastic Photographer, but he is truly a wonderful person!! It was a great privilege, to be able to take his workshop! I will say one last thing….. If you do choose to take one of his workshops, don’t plan on much sleep… lol….but the adventure you will have, will be entirely worth it! Thanks Mark, for the amazing adventure!! I did a one day one-on-one workshop with Mark in the Pacific Northwest and had a total blast!! We started at 3:30am to get out to some waterfalls before sunrise..... The entire day was an awesome adventure, one where I learned a lot (particularly as it related to processing) and I had a bunch of fun!! I look forward to exploring more off-the-beaten-path spots in the Pacific Northwest and beyond with Mark. He is an exemplary pro! Mark Metternich and his Wild Light Workshop (The Very Best of Oregon) by far exceeded all my expectations. I had never signed up for a tour of this nature before and I was not sure what to expect. The best description of Mark can best be summed up as an individual who is part photographer, part tour guide, part photo/Photoshop guru, part adviser and he excels in each of these individual areas. From a photographic standpoint his knowledge begins with the use of the camera, from capturing the digital image to extremely advanced post processing techniques. He does not disappoint. He is always willing to share his experience as it best applies to the situation. As for being a tour guide, Mark goes above and beyond in getting a group to the best spots at the best time. No one can guarantee the weather or a cloud formation but just going to places I had never been opened up my eyes to some truly awesome places in the American Northwest. (And I have more than a few stamps in my passport.) As for being a guru, Mark was able to take his knowledge of photography and tour guide and mix it into an experience where you feel like you have known this guy for a long time. Everywhere we went, people knew Mark or were wanting to meet him. I was not surprised after spending a few days on the tour and finding the whole experience quite affable. And finally, as far as an adviser, Mark truly has a deeper connection to the Earth and points beyond. After hours of uplifting conversation, I realized that even if I had chucked my camera into the water or over the mountain side, I would have enjoyed the experience of traveling with this tour operator just as much. While there are many photo workshop tours to choose from and there are many excellent photographers running them, I would not hesitate to sign up for another tour with Mark Metternich’s Wild for Light and see what other adventures await. And I will. Working with Mark was not just being on another tour; it was a chance to go beyond my comfort zone and see what the Northwest and Photography have to offer. "I was fortunate to be able to tour and shoot with Mark during a recent trip to the Oregon coast. He is passionate about photography and does an outstanding job teaching all aspects of landscape photography. I think very few photographers are as talented and well rounded as he is in all facets of photography. From in-depth knowledge of the best locations, practical advice on how to capture more striking images in the field, to high level post processing techniques, and all the way to the nuances of fine art printing. Regardless of your skill level, having a workshop with Mark will most certainly help you take your photography to the next level. Just as important, Mark is a great person to hang out with! We had such a great road trip and I came away knowing I have a new friend in Oregon." "In Sept. 2011 I was fortunate to spend a full week with Mark on a private "Pearls of Oregon" tour photographing the amazing landscapes of Oregon. It was my first big landscape expedition, and while my hopes were high going into it, Mark's knowledge, experience, and friendliness turned it into the adventure of a lifetime, and that's no exaggeration. He chose the top spots throughout the state, chased the weather to capture the best opportunities, and once we reached each spot, he taught me how to shoot landscapes under every set of circumstances in a predictable, easy-to-understand fashion. Photography has been my passion for years, and Mark showed me how to take it to the next level. Probably up several levels, actually! His knowledge of advanced Photoshop post-processing techniques blew me away, and I've already been able to apply some of them. I came home with a treasure trove of amazing shots, many of which are worthy of putting in a gallery. I simply can't speak highly enough of Mark and the photography experience of that week in Oregon. He loves what he does, is damn amazing at it, and IMO a tour with him is a no-brainer. Next up? The Southwest!" "I recently had the opportunity to tour Oregon with Mark, spending a week photographing the Columbia River Gorge, Mount Hood, and the Oregon coast on his "Pearls of Oregon" tour/workshop. That week of instruction together with the Photoshop lessons that followed brought my work to a whole new level. Not only did I learn a lot of technical skills, but I gained confidence in my shooting, and learned to make the most of every opportunity. 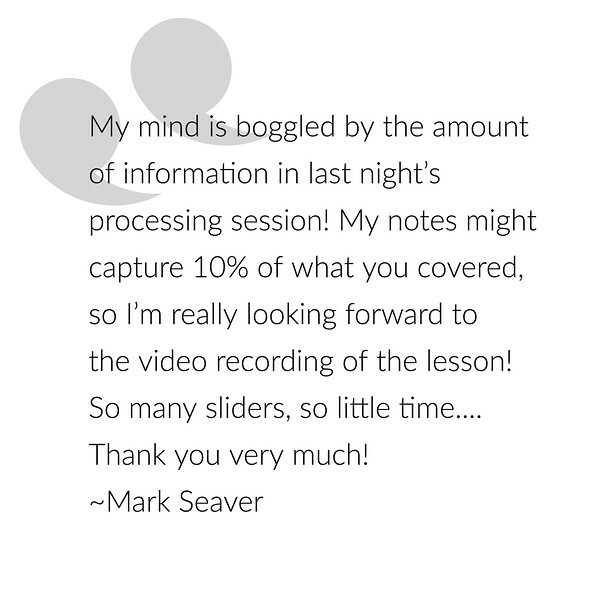 Mark is great at sharing his expertise in a manner that is easy to understand, whether you're shooting reflections of Mount Hood in the moonlight or learning Photoshop through Skype. He works hard at perfecting his craft and helping his students to do the same. I can't recommend his tours more. He did a great job of getting me to the right place at the right time. I added some fantastic shots to my portfolio on my tour, and my skills have increased greatly because of it." "I discovered Mark's work online about 5 years ago, when I was first getting into landscape photography, and instantly added his site to my favorites. Then, sadly, my hard drive crashed and I forgot his last name, leaving me with only the memory of “that Mark-guy who creates master photographs.” Early in 2011 I decided I wanted to pursue landscape photography as a career, despite the plethora of skeptics, cynics, and other naysayers. I later received some advice to find an established photographer to learn from. Around that same time, I remembered Mark's name completely out of the blue, Googled him, and discovered that he was running workshop/photo tours. I consider this to be nothing short of a stroke of Providence, as my tour with Mark has begun to take my photography career out of the realm of theory and into the realm of reality. Mark is obviously highly skilled and knowledgeable, but more importantly, he is very encouraging and optimistic. I have spoken with many other talented landscape photographers about pursuing a career in landscape photography, and most of them seemed jaded at best, often discouraging me from pursuing my dream. I didn't want to learn from someone who believes it can't be done, and Mark's optimism and excitement was plain to see from my first e-mail exchange with him. Thanks to his encouragement and mentor-ship I am now selling my work at exhibitions and art shows taking more and more steps toward having a job I love. He's a blast to hang out with too! So schedule a tour with him already!" "I was first introduced to Mark about 3 years ago when I decided to get serious about my photography. Since then we have been on numerous trips together throughout the Southwest. I have found that being on location with someone of Mark's abilities is the best way advance your skills and eye. He takes the greatest care to insure that you are not only ready for the shot but understand exactly what is going on with the camera. His sense of adventure and local knowledge have both contributed to accessing fantastic locations. Overall, I would highly recommend a trip with Mark if you are ready to take your photography to the next level."